I’m a fan of kumquats. They’re tiny little bursts of concentrated orange tartness that pops in your mouth like candy. And I love that you don’t need to peel ’em…just pop ’em and go. However, I ‘ve never really looked inside of one before, never having a need to before. But then a bought a large bag of kumquats in Chinatown and wondered what else I could do with these tiny citrus fruits. I found a recipe for kumquat cookies and the deal was sealed. 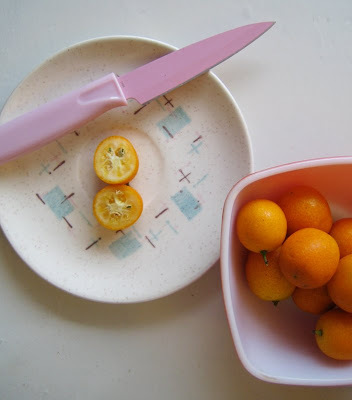 When I started chopping the kumquats I was surprised to find out that there’s not much fruit or juice to these little orange balls….just pith, rind and seeds. Who knew? I guess it’s what makes these cookies so great. The flavour of the kumquats provide a concentrated burst of orange flavour that goes so well with the chocolate. These cookies aren’t overly sweet but they pack a wallop of deliciousness…and this coming from someone who claims that she’s not even a fan of the orange/chocolate combo! Pass on the Terry’s chocolate orange and snack on these instead. Oh, and that sweet pink knife up above? I bought it locally at a kitchen shop in Chinatown, but it’s available on Amazon: Kuhn Rikon Pink Nonstick Paring Knife with Sheath 4-in. Preheat oven to 375 F. In a mixing bowl, cream the butter and sugar together until fluffy and pale. Add in eggs and vanilla and beat until well combined. In a separate bowl, mix together the flour, baking soda and salt. Add the flour little by little to the butter mixture and beat slowly together. Stir in the oatmeal and kumquats and finally the chocolate chips, stirring until everything is evenly mixed. Drop by spoonfuls onto a cookie sheet and bake for 10-12 minutes until golden. Cool on rack. It’s funny that you mention kumquats, they just mentioned them on Slashfood yesterday! I’ve never had a kumquat before – I’m too intimidated by them, haha 😀 Such enticing cookies though!! My parents have a kumquat tree. They brought some down for us once and we ended up making a salsa with them to on some barbecued salmon. Very good! I would love to add these to my next batch of cc cookies. Love that creativity girl! That plate looks so familiar…..
Oh this looks like a lovely flavor combination! You can’t beat a chocolate cookie, and I imagine the kumquats just make them even more indestructible! This is perfect! I’m doing oatmeal week on my blog. I’m going to post these tomorrow as long as that’s okay with you. If not shoot me an email at notanotheromnivore (at) gmail (dot) com. I’ll give you full credit of course. I’ve never had a kumquat, but I do love the combo of chocolate + orange so I think I may need to seek some out. Love your blog! I don’t think I’ve ever had a kumquat either. proof of the fact is that it took me two tries to spell it right. oops? 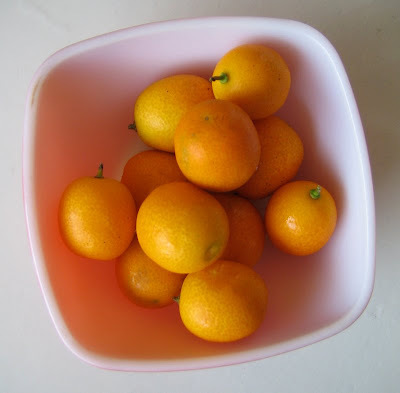 My grandparents had a kumquat tree in their yard, and I remember thinking that they were the one tree that we couldn’t eat from (as opposed to grapefruit, orange, etc). Funny that I’ve still never eaten one! I, too, love the citrusy goodness of kumquats, and now I’m eager to try them in cookies! This is a great idea! I love kumquats. Man, if this (alternative) oatmeal chocolate chip cookie recipe is as good as it looks in the pictures, I’ve totally finished my search. Plus, I LVOE orage+chocolate! 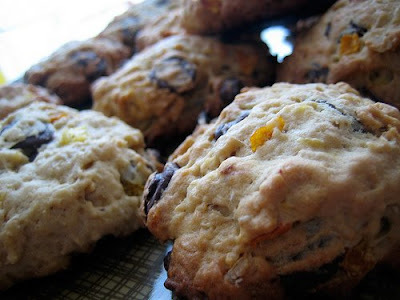 You know that i love chocolate & oatmeal cookies, and these sound over the top! Now I'm thinking about kumquat marmalade. Yum, this sounds like a great combination! I’ve never had a kumquat before, and this sounds like just the recipe to experiment with. They look delicious. Thanks for sharing! These sound perfect! I saw kumquats at the market the other day and I almost bought some but couldn’t think of a way to use them. If I had known they made delicious cookies I would have bought them ASAP! Where did you get that awesome knife???? I am crazy about it! go kumquat go! i met you at toque, hope all is well in your craftin’/bloggin’ world! Betsy, it’s a great combo together! VeggieGirl, don’t be intimidated. They are delicious!! Ellen, what a great idea. Dawn, why yes, it’s an Orla Keily Target plate! Jodye, yup, these are amazing! Bijoux, when baked, they don’t have that tart flavour…just concentrated orange goodness. I’m sure you’ll love them. Celine, they are worth seeking out. Ha, too funny, Culinary. I think you’ve been missing out! Go ahead, Miss Kate, so delicious. Ginger, it’s better than the photos. Seriously. Good luck in your search, Daily Spud! Amanda, thanks for all the suggestions! I love the confit idea. Hayley, seek them out as they are pretty delicious! Tracey, I bought it in a local kitchen shop. I added the amazon link to the post! I would never have thought of combining kumquats and chocolate, but now that you mention it, it does sound like something my husband would love.